Using the newly deployed utility meter with a loop energy saver… Seems that the daily usage is over reading or that the value reported is decimated by x10. Are you first taking the live kW reading from loop and storing it as a kWh value? The utility meter entity adds changes over time so just feeding from the instantaneous usage will give you very wrong figures! As a side note, has anyone else got this working and found that using peak and off peak, the peak rate records everything while off peak only records when active? This seems like a bug but it’s ruining my data. The loop energy saver reports a live kWh rating. Is that the correct unit? Do I need to convert this to Kw using the inergration sensor? The loop will report instant energy at the moment it took a reading, this is in kW as it’s the amount of energy flowing at that moment. 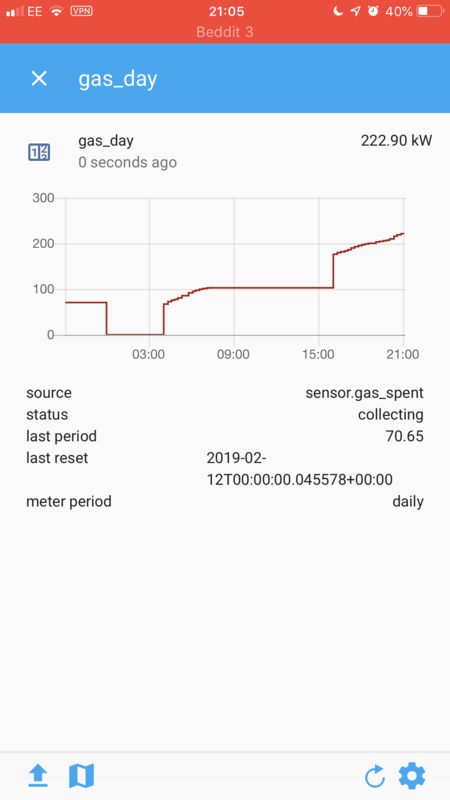 If you use an integration sensor you can have Home Assistant calculate the actual consumption over time, this will be in kWh which can then be used by the utility meter to track consumption. I don’t know why the utility meter isn’t smart enough to see it’s getting a kW reading and do the integration itself, maybe that will come in a future update. kWh is used to measure consumption/battery capacity etc whereas kW is used to measure flow of energy. you can derive one from the other though. Just wanted to come back and add to this that the utility meter IS still over-reading for me, although not by such a huge amount as when I was feeding it the kW reading direct from Loop. I reset my counters last night, and the day rate didn’t pause while the night rate was accumulating, which is bad enough, but then the day rate is also reporting about 12kWh more than i’ve actually used according to Loop (which agrees with my running total stored in an integration sensor). 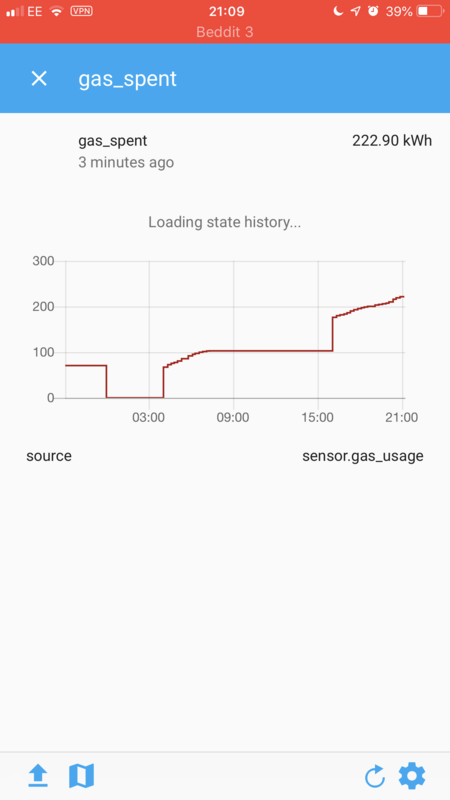 The integration sensor feeds the “utility meter” sensors, so i’m not sure how this has ended up about 30% over! If i’d left it feeding directly from the loop sensor it would be many times more than that too. The integration sensor and utility meter have been split because there are other uses for the integration meter (initially the sensor was named sensor.energy). Also because many people already have energy readings and don’t need the integration. I don’t fully understand the issue you are facing… can you provide your configuration and more details on your setup ? Not sure if your question is aimed at me and I don’t want to hijack wonkydog’s thread too much, but the issues I have are the utility meter not suspending the “peak” rate meter while the “off-peak” meter is active, so I get double recording, and the reading, like wonkydog, is higher than it should be - today my total metered energy by the Utility Meter sensor is 55.41kWh but I actually used 41kWh. The integration sensor that takes kW readings every few seconds from my Loop energy monitor (a clamp meter on the live feed into my house) is showing 41kWh as is the loop dashboard. The relevant bit of my HA config is below. Can you add some logging to trace this down ? Gas day should be the kWh used today and is the utility meter component. 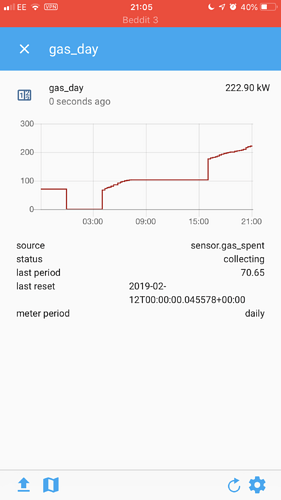 The reading seems to reset as expected however when the gas is used again the sensor seems to resume from yesterday’s value. Gas spent is the inergration sensor for reference. Also the gas sensor on this platform reports every 15 minutes. Any help greatly appreciated. I have also enabled the logger and will report anything that comes up. Similar to report here. Seems much more stable. I actually think that the loop report is behind the values HA provides. Loop seems to lag by about 0.5kwh in electricity. Do I need to skip the integration sensor and just point the utility meter to the loop gas entity? Again any further advice appreciated - I appreciated all the suggestions so far! Thank you! Yes for gas i think you can stick with the loop gas entity, only the elec needs converting to kWh first, gas is already in that unit. Just to confirm I have the power meter running through the integration sensor and then the utility meter. 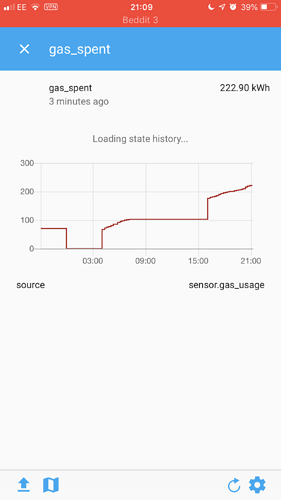 For gas I am now running directly into the utility meter and all results seems to be within about 0.5kwh of what the loop website reports. Thats pretty good for what I need the sensors for so all happy on my side. Sounds good, as of yesterday my electricity readings seem to be accurate too, and Peak/OffPeak now correctly record although I’ve changed nothing at all! Now feeding it into Grafana and liking the pretty stats. Just wondering if your experiencing any issues with the loop energy saver gone assitabt intergration with versio 0.89? I can’t seem to get a power or gas reading and I’ve not changed the config? Hi are things your end? Yes my loop energy component broke on Thursday. After some prodding and finding the latest HA build didn’t fix it, I had a look at github and someone has committed a change to the component. It will therefore be fixed in the next build but if like me you would rather have it working now, download the updated version at https://github.com/home-assistant/home-assistant/blob/7226e917edb918868314ef98f09b597639f5059e/homeassistant/components/sensor/loopenergy.py and either overwrite the original or add it to /config/custom_components/sensor/loopenergy.py if you’re using hass.io and can’t edit core config. Thanks for your help. Thats gets it working nicely for now! No - at least for me I didn’t. Are you sue your gas utility meter points directly to your gas sensor? I had mine going through the integration sensor first and this was causing me to have similar reading to you?